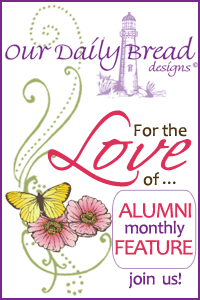 Welcome to Our Daily Bread Designs Alumni Team Monthly Feature Post. This month the Alumni Team is featuring projects created with Our Daily Bread Designs stamp sets that have a Vintage Theme. This is our last Alumni Team Monthly Feature Blog Hop, starting in July, the Alumni Team will be posting projects along with the Design Team for the new releases! I created a Mixed Media card using Our Daily Bread Designs Time and Save Time stamp sets. To create the background, I used the Gelli Plate, Acrylic Paints and The Crafters Workshop Gears Stencil, on Mixed Media Paper. Once the paint was dry, I stamped the clock from the Time set and the quote from Save time in Ranger Black Archival. I cut the quote from the center of the panel, layered it on a Black panel; placing it over the original panel with dimensionals. Very pretty card!Love the colors,and the stamp!!! See you had time to play....love the colors. Oh Wow that background is so cool, like the matting around the sentiment and great stamping of the clocks! Beautiful Lisa!! Just love the cheery colors and the clocks in the background!! So cool...the background is really neat! Beautiful layered colors and prints...love it! Very pretty card and also nostalgic- this song always touched my heart. Wow...what vibrant wild colours, love the time in a bottle verse, and so well coordinated with your clocks! OH this is so Hot! Love those stunning colors and what a fabulous background! Awesome card!